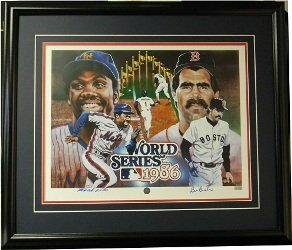 With the 25th anniversary of the 1986 World Series approaching, there's been a surge in interest surrounding the event. Charity bowling, sitcom guest spots and high-end memorabilia auctions have all helped put the spotlight on the two players at the center of the most famous moment to emerge from the series. A new piece of art captures one of baseball's most notorious mess-ups. Mookie Wilson and Bill Buckner will be forever connected thanks to a seemingly routine play gone wrong at a key moment. During Game 6, Wilson, hitting for the Mets, knocked a simple ground ball to Red Sox first baseman, Buckner. Buckner misplayed the ball, allowing the Mets to steal a win. This sent the series to a deciding game, one which New York went on to win. Artist Rob MacDougall has captured the error with a new print entitled "The Play," which is signed by Wilson and Buckner. Using a lifelike style, the 16 x 20 piece of art features three different images of both players. Most prominent are detailed head shots. In front of each is a smaller action shot. Finally, the background space between the two players shows the infamous play that connects them. Approved by MLB, the print comes with a double matte and black frame. The cost of the limited edition artwork is $399 and can be purchased at a special website set up by Celebrity Sports Marketing. RAY KNIGHT 3 SIGNED AUTOGRAPHED 1986 WORLD SERIES BASEBALL! Reds, Astros, Mets! RAY KNIGHT 2 SIGNED AUTOGRAPHED 1986 WORLD SERIES BASEBALL! Reds, Astros, Mets!